Linnaea borealis – Linnaea is named after Carolus Linnaeus 1707-78), the ‘father of botany’, who established the classfication system of plants and animals which assigns each organism a two word name (genus and species). Borealis is named for the Greek god of the north wind, Boreas, which means ‘northern’. in Latin: Linnaea borealis L.
A low, creeping wildflower, standing only 5 cm to 10 cm tall, with a semi-woody stem. Stems creep along the forest floor and can grow to as long as 1m, forming loose mats. Leaves: Leaves are egg-shaped, 1 cm to 1.5 cm across, and usually have a few rounded teeth on the tip. Leaves do not occur on the flower stems. After the flowers and fruits have faded, the evergreen leaves remain on the plant, often hidden under the winter snow. Flowers: Flowers are small (6 mm to 15 mm long), pinkish white, bell-shaped, and are fragrant, especially towards evening. 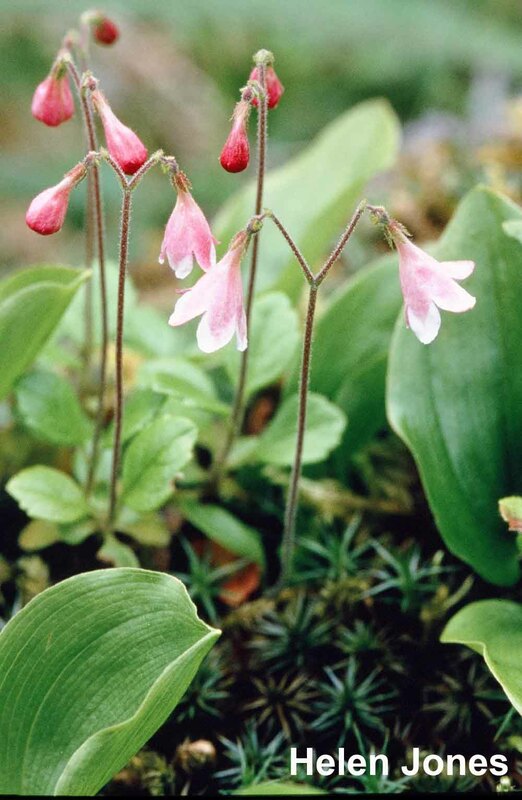 Flowers occur in pairs on V-shaped stalks. Fruit: Egg-shaped nutlets are 1.5 mm to 3 mm long, with hooked bristles. Once bloom is passed, small ‘nutlets’ develop. The hooked bristles on these twinflower nutlets catch on to fur, feathers or clothing of passer-by, who then carry them to new locations. 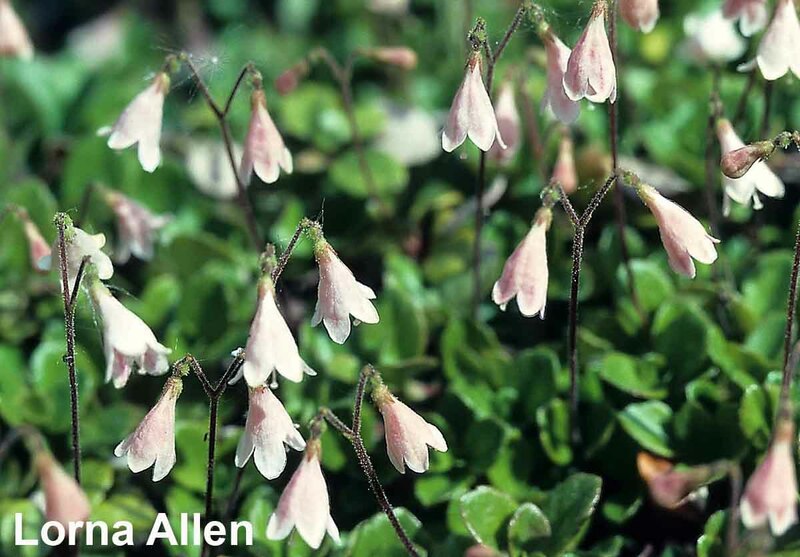 Twinflower also spreads and forms colonies by sending out their long, rooting stems that send up shoots along their length. This is the only species in its genus. It tends to be found in areas of cold air drainage. Some First Nations People made a tea from twinflower leaves. 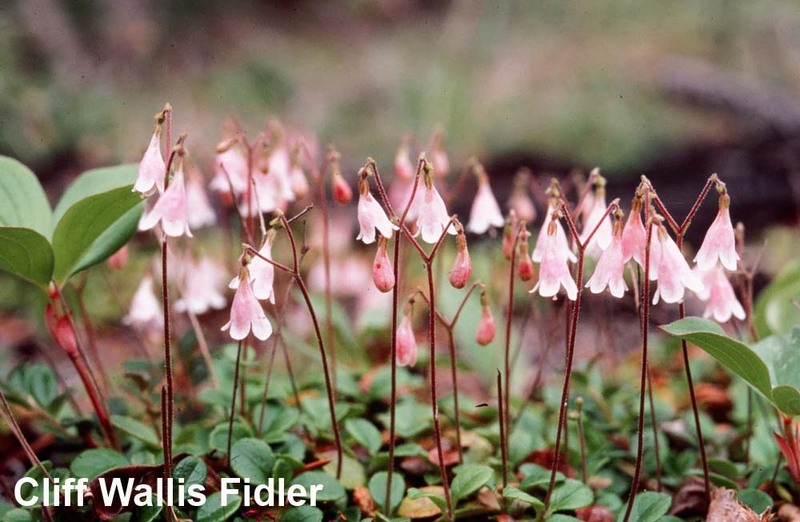 Native groups in eastern North America used twinflower to treat women who were pregnant, people with inflamed limbs or those with colds or suffering from insomnia, and children suffering from cramps, fever, or crying. Twinflower is easy to propagate and makes an excellent native ground cover. It spreads rapidly, but not aggressively, in partially shaded spots. Beaubien, E. 1991. 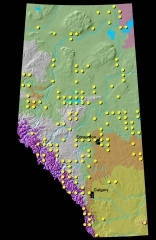 Phenology of Vascular Plant Flowering in Edmonton and Across Alberta. Thesis, MSc. University of Alberta. Edmonton, Alberta. Erichson-Brown, C. 1979. Use of Plants for the Past 500 Years. Breezy Creeks Press. Aurora, Ontario. Johnson, D., et. Al. 1995. Plants of the Western Boreal Forest and Aspen Parkland. Lone Pine Publishing. Edmonton, Alberta. Kershaw, L., A. MacKinnon, and J. Pojar. 1998. Plants of the Rocky Mountains. Lone Pine Publishing. Edmonton, Alberta. Marie-Victorin, F. 1991. Flore Laurentienne 3rd ed. Les Presses de l’Université de Montréal. Montréal, Quebec.